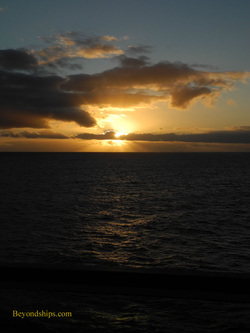 A transatlantic crossing is a unique cruise experience. This is so even though not all transatlantic crossings are the same. Queen Mary 2 regularly goes from one continent to the other non-stop across the North Atlantic (see separate article). Most cruise ships cross mid-Atlantic where the weather is warmer and visit a few ports on either side of the pond. The focus of this article is a crossing that took yet another route, one that took the ship on a northerly course almost to the Arctic. In late August 2013, Royal Caribbean International's Brilliance of the Seas left Harwich England on a 15 day voyage that would take her from her summertime base in England to Boston, Massachusetts, where she would spend the autumn season. The first part of the voyage was port intensive. After leaving Harwich, Brilliance sailed to Le Harve in France, then to Dorset on the south coast of England, then to Cobh, Ireland, into the Irish Sea to Dublin, then north to the Faroe Islands and eventually to Reykjavik, Iceland for an overnight stay. Following Iceland, Brilliance spent five days at sea before arriving in Boston. 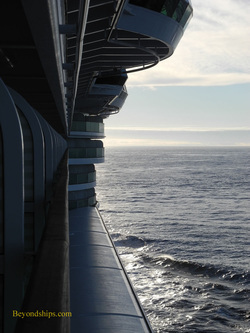 “It is like two different cruises.” observed Steve Davis, Brilliance's Cruise Director. The first part of the voyage was much like a typical European cruise on a Royal Caribbean ship. Guests focused primarily on the various ports of call. The ship was a place to eat, sleep and be entertained between the ports. Once the sea days began, the focus became much more on what was happening aboard the ship. Along the same lines, the entertainment is paced so as to keep up the excitement level throughout the voyage. “Obviously, you don't want to have all of your big entertainment things at the beginning of the cruise because everyone is getting up early for ports and things like that. So you build into it. You start off, you have stuff going on but you save all your big nights, big things towards the end. By the end of all those ports, everyone is in a good mood and you want to keep everyone in a good mood for the last five days at sea - - busy, doing things, being entertained so by the end of the cruise it has been an amazing cruise experience,” added Mr. Davis. Brilliance of the Seas is well-suited to make this type of voyage. One of four Radiance-class cruise ships built for Royal Caribbean, Brilliance is an elegant ship. Indeed, Brilliance can be thought of as sitting near the border between Royal Caribbean and its premium cruise line sister company Celebrity Cruises. At 90,090 gross tons, Brilliance is a medium size cruise ship so she has room for an array of dining and entertainment venues. However, she only carries approximately 2,100 guests, giving her a passenger space ratio more typical of premium ships. Moreover, she is intimate enough for passengers to get to know each other and the crew. “In order for us to provide truly excellent service, you have to have repeat interactions. This way you learn about your guests, the best way to serve them. You learn their habits. You learn their names,”noted Mr. Bailey. Indeed, Brilliance's crossings are particularly favored by experienced cruisers, i.e., people who know something about cruising. “With transatlantic crossings we always know we are going to have a very high Crown and Anchor Society count. Some people just live for the crossings because they love the sea days. I find it is the repeat cruisers who come on the crossings,” commented Mr. Davis. 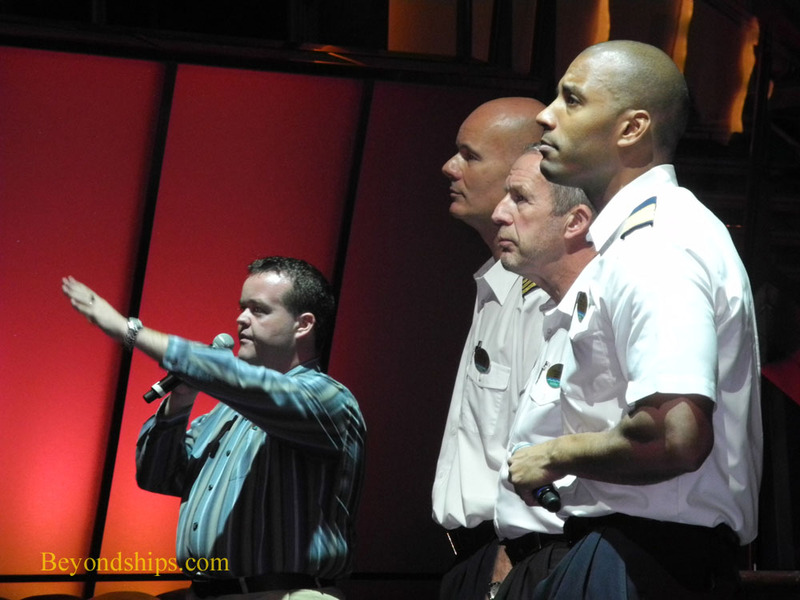 Above: Cruise Director Steve Davis, Chief Engineer Ivo Marenic, Captain Stig Nilsen and Hotel Director Dean Bailey at a question and answer session on Brilliance. Below: Scenes from the crossing. During our voyage, Brilliance did not experience any such storm. Captain Nilsen maneuvered the ship around some low pressure systems coming out of Baffen Bay and even the remains of a tropical storm but there was nothing to make the guests uncomfortable. 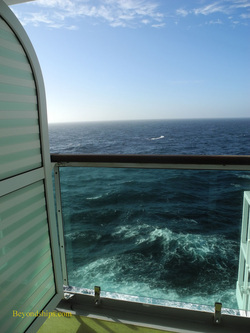 And during the cruise part of the voyage, the weather was quite sunny with the exception of Iceland. Life aboard Brilliance was Royal Caribbean's trademark style of relaxed activity. In addition to shows by the ship's production cast, a series of guest entertainers came and departed in the various ports. The array of specialty restaurants added during Brilliance's 2013 refit provided change of pace alternatives to the main dining room. Thus, even though it was a relatively long voyage, it was not a boring one. Perhaps the most important thing about a voyage like this is the quantity and quality of the experiences. Here, not only were there the variety of ports at the beginning of the cruise but also the interactions with passengers and crew aboard Brilliance of the Seas.